This past month I was given an assignment that required me to hop on the subway and race down to Chelsea, all for a college paper. I spent about 2 hours walking around Chelsea, an area I was not too familiar with, and took in everything I could. It was a good experience, and other than the fact that it was 24 degrees outside, all was well. 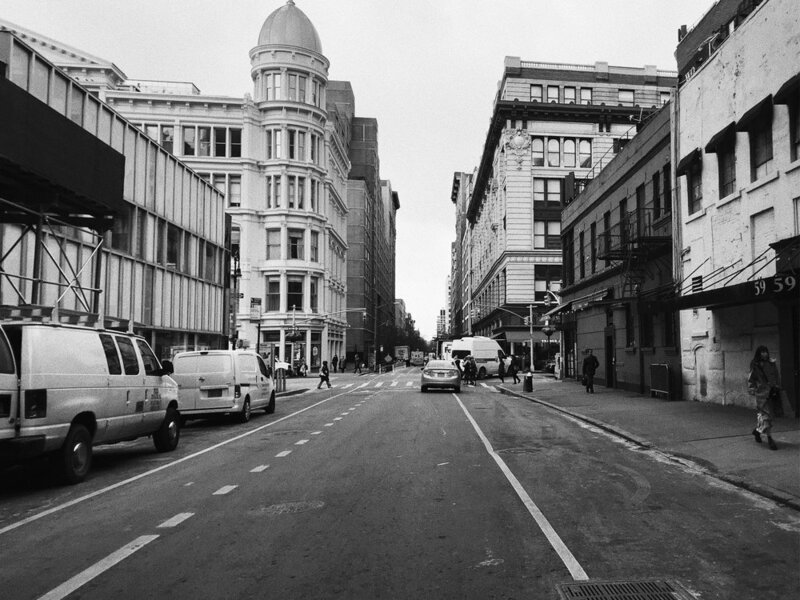 The photo I was assigned to recreate was based on one of Thomas Struth’s silver gelatin prints in his 12 piece series called “Streets of New York.” Struth is a German photographer and is best known for his black and white photography. His photo set was taken in early 1978, with each photograph created with a visual focal point looking down the street and into the horizon. The print titled, “West 21st Street, Chelsea, New York” was the specific one I was assigned to. My personal experience in the Chelsea area was very interesting and enjoyable. The journey started off by hopping on the 6 train and heading down to the 23rd Street station where I would then get off the train, grab a Starbucks coffee, and be on my way. At first, I didn’t feel comfortable walking around a new and unusual place, but as I opened up my mind I felt more at ease with the area I was in. I was able to immerse myself in a new location that I hadn’t spent too much time searching before. I walked down 21st Street until I stumbled upon the location of where my photo was taken. It was hard to find at first since the avenue it was on was not given to me, so I walked until I found it. Once there, I was surprised by how similar the location was to how it looked almost 39 years ago. Although not too much has changed, the types of stores and restaurants certainly have. Currently, there is a Vitamin Shoppe, a Bank of America, and a market/restaurant, where as in 1978 these places would not have been there except for possibly the market/restaurant. In the photos, some of the differences I saw weren’t too significant. The first difference was that there was a dome on top of the columned building that wasn’t there in the original photo. When that was built is unclear, but it seems in place regardless. Another thing that obviously appeared to be different was the abundance of modern technology, such as traffic lights and cars. Both have severely changed over time, and have ultimately changed for the better. In addition to the change in technology, there seems to be a change in regards to population. Today, there is an abundance of people out and about on the streets of Chelsea, where as if you look in the Struth photograph, there is almost no one in the picture. This is most likely because the demand for jobs in NYC or the desire to live in this area has increased a lot over time. When traveling in Chelsea, there is an indescribable sensation that everyone feels there. In a way, the neighborhood almost seems retro, as well as contemporary. For the most part, the location hasn’t changed in terms of building construction and appeal, although it is worth noting that a part of this area comprises of much gentrification. Towards the High Line area, there has been a ton of modernization and restructuring of certain buildings. While walking the High Line, the buildings close by are very new and in a “futuristic” way. This revisits the idea that everything is changing and becoming more modern. The use of glassware and neutral colors really capture the essence of what the buildings are like. While on the High Line, however, you can still see certain parts of the Chelsea area that have remained almost untouched. In some aspects, the area is being kept as it is to archive the architecture and what the structure was like in the 1900s. This directly connects to my photo assignment and how viewing the way the neighborhood is today, you can make comparisons from the past. My venture downtown allowed me to come to the realization that society is conflicted when it comes to keeping older buildings intact and creating new ones, a topic that is often up for discussion these days. There is this want and need for new and “improved” buildings, yet some prefer the look and historical aspect of preserving the older architecture. Chelsea tackles this duality throughout its neighborhood since there is gentrification and change happening, but nevertheless, some of the buildings are being kept the way they are. Sometimes you’ve got to find a balance between the old and the new and find a way to make it work, which is exactly what the quaint neighborhood of Chelsea is so great at doing.